A deep ravine, a thundering river and a collection of ropes swinging across from one side to the other. You can easily associate rope bridges with the difficult terrain of the Andean mountains. Despite the popular image, only very few of these Inca rope bridges remain. One of these traditional Inca rope bridges is Q’eswachaca Bridge, which crosses the Apurimac river. It is rebuilt every year in a fascinating tradition going back 500 years. The road that runs though the remote highland of Peru some 100 km south of Cuzco winds down into the canyon and meets the river at a bit less than 4,000 meter altitude. A bridge with an steel structure leads across the Apurimac river before the roads starts to climb out of the canyon. It would be a typical road scene somewhere in Peru but then there is the second bridge about 100 meter below the road bridge that makes the place special. Q’eswachaca bridge is made completely out of local grass in the traditional way of Inca rope bridges. The cables made of grass hang between the foundations on each bank of the river that forms a narrow gorge of less than 30 meters. 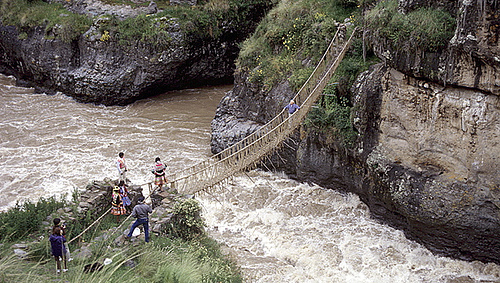 Inca rope bridges similar to Q’eswachaca bridge were key structures in the Inca road system, the Qhapaq Ñan. They ideally suited the needs of the Inca. As there were no vehicles and transport and communication was done on foot and with Llamas, the bridges could be narrow. They were built with material available on site. In the sparse vegetation of the Andean highlands that basically means plant fibers. Since the Spanish conquest of the Inca empire, more and more fixed bridges were built to replace the Inca rope bridges. They have obvious advantages: They can be used by vehicles and they don’t have to be rebuilt every year. A lot of the traditions around traditional bridge building thus have been lost. The communities around Q’eswachaca bridge however made a conscious decision to keep their 500 years old traditions alive even with the steel bridge in place. The communities around the bridge come together each year in June to build a new bridge in a fascinating ceremony. The following film by the Peruvian Institute of Culture shows that the bridge and the ceremony is deeply rooted in the local culture, beliefs and the Quechua language. The UNESCO recognized the tradition by listing it in the register of intangible cultural heritage in 2013 and the Smithonian National Museum of the American Indian runs an exhibition on the Inka road system (Jun2015-Jun2018), which features a small version of Q’eswachaca bridge in Washington, USA. Unfortunately, there is very little information available about other current or previous Inca rope bridges. It is good to see that there are efforts to recognize the culture behind these structures. Maybe that will even lead to the reconstruction of more of these spectacular structures. The one thing I was dying to know was how do they get the foundation ropes from one side to the other. And in this whole film, you never say that! Do they use the old bridge to do it? Which still leaves the question answered, how did the first people do it? There is a short sequence in the video that might answer your question. Have a look from 5:30 min onwards. You see how the strong cables are brought into position and at 5:54 min you can briefly see how they are pulled across using thin ropes. This might have also been the way to bring across the initial cable hundreds of year ago (or when the bridge was damaged). Throwing a stone across with a thin rope attached seems possible. That could then be used to get the proper thing across.